Common Size: 59" x 41"
Weather proof with rubber gasket for outdoor use. Locking swinging door with keys to prevent tampering. Clear polycarbonate window protect signage while making them easily visible. Black rust resistant aluminum frame is durable for years of use. All mounting hardware & pushpins are included for a quick and easy set up. 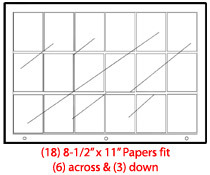 54-3/4" x 36-3/4" Cork surface can display up to (18) 8-1/2" x 11" postings. 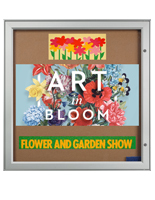 This enclosed bulletin board cabinet for indoor and outdoor use is a great tool for promoting events. 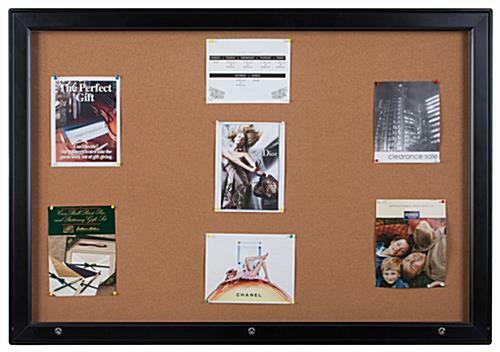 Corkboards are often used to communicate with associates in a business, students on a college campus, as well as people in an apartment complex. 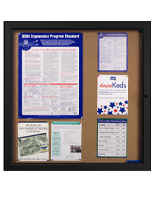 Each enclosed bulletin board cabinet also works well in a town square to keep residents up to date on all the towns happenings. These outdoor cork displays can hold (18) 8-1/2" x 11" papers or (16) 11" x 8-1/2" flyers. 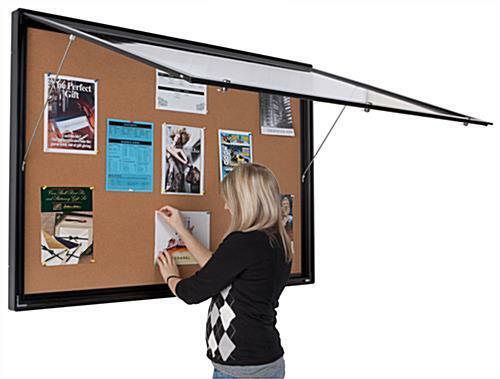 This black aluminum enclosed bulletin board cabinet comes with a bag of push pins to hang posters right away. Outdoor tackboards made of cork are 59" x 41" to really draw in attention. 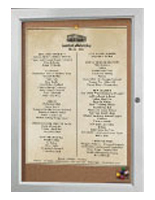 Each message display is an enclosed bulletin board cabinet that includes all mounting hardware. Displaying this corkboard for indoor and outdoor use is an easy task with the included instructions. 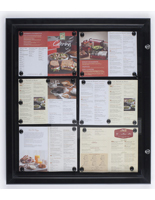 Customers can choose to hang this enclosed bulletin board cabinet in either vertical or horizontal format. These cork tackboards are only 2" thick so they do not get in the way of people passing by. 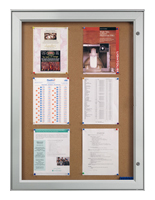 This large format flyer holder is an enclosed bulletin board cabinet that has a locking hinged door. There are door support rods to keep the door from closing when in use. 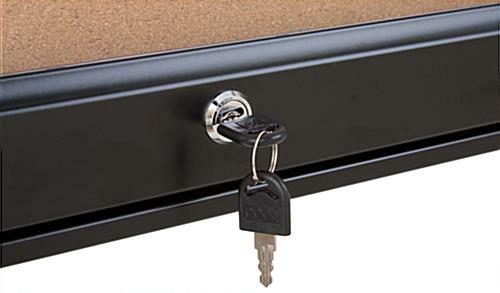 Each enclosed bulletin board cabinet has (3) locks to keep people from tampering with the notices. Three sets of keys are also included for users to hand out to associates that are in charge of updating the memos. 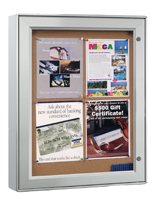 This outdoor cork display is an enclosed bulletin board cabinet that has a clear polycarbonate window for easy viewing. Polycarbonate is a very strong plastic that is highly impact resistant. 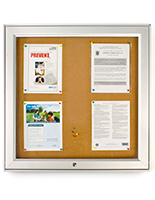 The frame of this indoor or outdoor corkboard is constructed of durable aluminum. There is a black powder coated finish on the metal construction to work well in any setting. 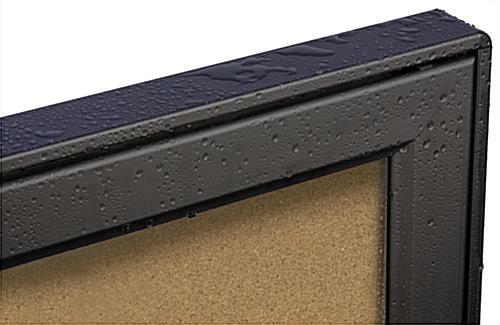 These large cork displays have a rubber gasket on the inside of the door to prevent water from getting inside the frame. 59.0" x 41.0" x 2.0"
My Display cases arrived within 2 weeks of ordering. I was very happy with the quality. I had to modify the hanging hardware so that it would work with 16" stud walls. Otherwise not all that difficult to hang. Will be buying from Displays2go the next time I need a display case. Thank you for the review, Patricia. If you are planning on ordering from us again, feel free to follow us on social media; we offer various social media-exclusive discounts and deals that you may be interested in for future orders!